• The Height is the the length of the spiral. 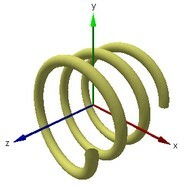 • The Spiral Radius is the length from origin to the center of the tube. • The Tube Radius denotes the tub thickness. • The Number of Turns is the number of revolutions from bottom to top of the spiral. This may be a non-integer value. • The Number of Segments is the total number of segments from bottom to the top of the spiral. • The Points Per Segment are the number of circle elements for each segment. • You can set the position of the origin.